Elements Applied: Dried bark is commonly applied in herbal medicine. Prunasin, which belongs to cyanogenetic glycosides. Wild Cherry Bark is mostly applied in herbal medicine due to cyanogenetic glycoside content. Other; scopoletin (derived from coumarin), sugars, 3,4,5-trimethoxybenzoic acid, tannins, p-coumaric acid. History: Wild Cherry syrups have been applied for relieving pulmonary conditions and coughs for a long time period. Additionally, it was considered beneficial for acute pains and diarrhea. Used For: The herb is known to treat coughs by inducing expectoration, relieve diarrhea, soothe nervous conditions, and reduce spasms. Wild Cherry Bark is mostly applied to relieve coughs, accompanied by irritation, whooping coughs, and bronchitis. Mixed with other herbal remedies it will be a good aid in asthma. Still, one should remember that relieving coughs won’t heal the condition in general, thus, it should be controlled by medical specialists. The herb can also be applied to improve digestion due to its bitter content. Eye inflammations can be relieved by using cold infusion made of Wild Cherry bark. Conventional homeopathists prescribe the plant for weak but rapid circulation, irritating coughs, cardiac pains, lack of appetite, pyrexia, dyspnoea, tachycardia associated with debility, and muco-purulent expectoration. Commonly mixed with: The herb is compatible with a wide range of plants. Additional Info: Being indigenous to North America, wild cherry trees can be now found across the globe. Preparation and Intake: To prepare an infusion, take 1 teaspoon of dry bark for a cup of boiling water and steep it for ten to fifteen minutes. The result is consumed thrice per day. 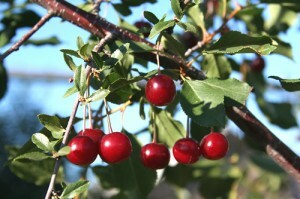 Safety: Taken in large quantities, wild cherry may result in cyanide poisoning. Still, this fact is not proven by its long-term application in clinical conditions, and wild cherry is thus considered safe. There is no further data concerning the herb’s safety level. It is possible that the plant interacts with the medicine you use. Speak to your health-care provider before taking the remedy.